Cannabis dispensaries have been buying up weed at bargain basement prices. As California counts down to the commencement of a new recreational cannabis industry, the wholesale price of pot has been crashing. Wholesale prices have been dropping for a decade, and the decline has accelerated in the past year due to an overabundance of unregulated weed. The pending exclusion of thousands of farmers from the state's new legal pot market and the uncertainty about California's looming new regulations are also prompting dispensaries to buy up as much pot as possible. Wholesale pounds of medium-to-low-grade cannabis are going for $500 to $700, a steep drop from a year ago when growers were getting around $2,000. The per pound price has plummeted even further from the 2008 high of $4,000. Craft farmers who grow top-shelf weed are still getting in the neighborhood of $1,500 to $2,500 per pound at dispensaries, but in 2018, the majority of those growers, who often work in small spaces such as garages, basements, and sheds, will not be state permitted for the legal market. Adding to the plunging wholesale prices is the state's slowness in permitting cultivators. The California Bureau of Cannabis Control started the application process late, and to make up for it, the bureau has given dispensaries a six-month grace period during which they can continue to sell unregulated cannabis grown on the black market. The grace period has created a buyers' market for dispensaries, which are stocking up on the last unregulated harvests, and unregulated farmers are lowering their prices to sell off their surpluses. Dispensaries have the added incentive to stockpile wholesale weed because it's uncertain if the state will be able to permit enough cultivators to supply the new recreational market, which is expected to greatly increase demand. The online permitting process began earlier this month, and as of last week, the California Bureau of Cannabis Control (CBCC) had issued only 71 permits to cultivators statewide, according to the CBCC website. CBCC spokesperson Alex Traverso said the state has fast-tracked the application process and is offering assistance to permit seekers. "And we have hundreds of applications in the pipeline, so we expect there will be enough cultivators to supply the recreational market," Traverso said. The state is aiming to issue 10,000 cultivation permits, said Hezekiah Allen, executive director of the California Growers Association, a nonprofit that represents cannabis farmers. "The truth of the matter is: Currently, only about 600,000 pounds is sold in the regulated market," Allen said. "It will only take about 3,500 to 5,000 permitted farms to supply the new market, which have so far only been approved to operate in a small percentage of the counties and municipalities in the state." The wholesale price drop is harming craft farmers the most — particularly those who have filed applications for local and state permits. 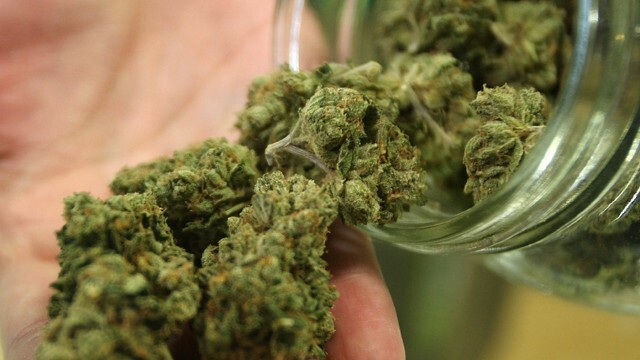 Their operations are smaller and will be less able to accommodate the market's new fees, taxes, and requirements, so their profit margins will be squeezed due to high application and inspection fees, taxes, security requirements, packaging costs, testing, and mandatory "track and trace" — a state regulatory process that will follow each pot plant from seed to sale. The craft farmers who have chosen to not file for state permits will be completely frozen out of the state's new market, which has put downward pressure on the wholesale prices of top-shelf cannabis. "Right now, I'm still getting a good price per pound at dispensaries," said Joseph Snow, a craft farmer who grows high quality indoor cannabis. "But after the new year, I won't be able to sell to dispensaries any longer, and the permit process is simply too expensive for my operation." It's also unclear how much consumers will benefit from the huge drop in wholesale prices. Each city has different pricing structures and various dispensaries offer discounts, but according to MarijuanaRates.com, the retail price of cannabis at dispensaries has steadily risen during 2017 despite the plunging wholesale prices. This past summer in Los Angeles, consumers were paying an average of $10 a gram. By fall, the average cost of a gram had jumped to $14. In San Francisco, consumers saw a similar rise, from an average of $12 per gram to $19. When the new year kicks in, so will a host of fees and taxes, which is expected to further raise prices. In Oakland, Harborside has been offering steep year-end discounts, but the promotion has run under a banner headline declaring that cannabis taxes will jump significantly starting on Jan. 1. The market is on the verge of a profound change and when pot prices will stabilize is anyone's guess.